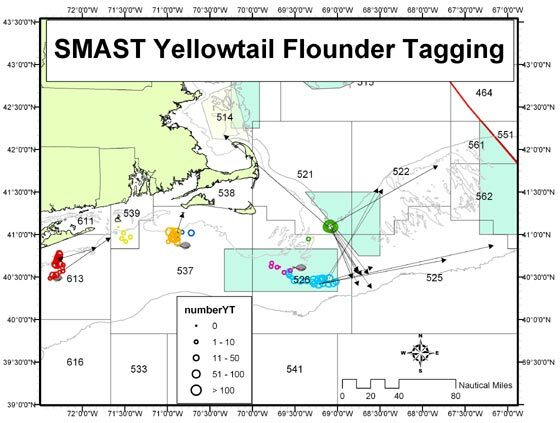 To date, SMAST has deployed 2709 tags in southern New England (Fig. 1), completing a total of seven (7) tagging trips. Trip dates, tagging	areas, the total number of each style of tag deployed, and the size	distribution of tagged fish are displayed in Figure 1. The colors of the circles on the map correspond to the colors on the list of vessels below. Click on the circles on the map to see tagging details for	each tagging trip. The arrows represent the locations of some early tag returns. Arrows are drawn from the release location to the recapture location. Figure	1: Geographic location of all release sites for yellowtail flounder tagged by SMAST. Different colors represent different vessels/trips. The size of the dot is in relation to the number of fish tagged.